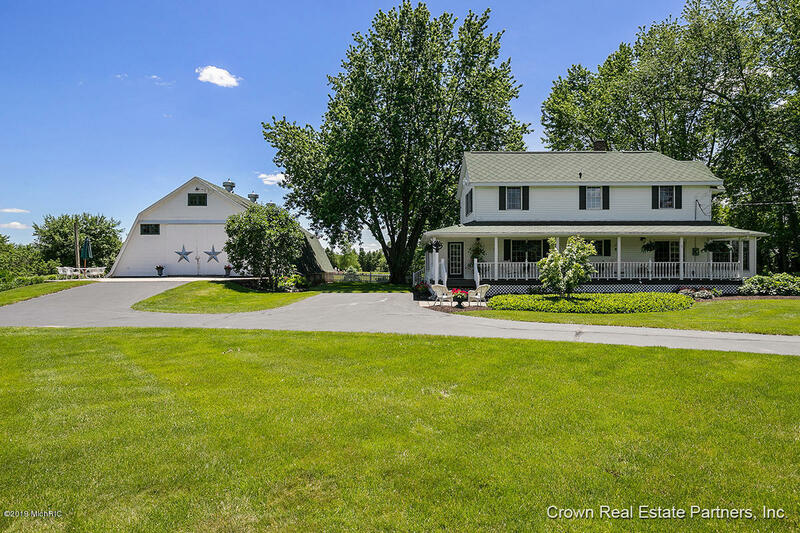 Majestically positioned on 3.51 acres, this charming farm house offers tranquility & privacy of country living with smart, modern amenities. Whether sitting with your guests on the expansive porch or welcoming them into the home, this property has an abundance of choices for gathering and entertaining. Entering thru the enclosed back porch, you will make your way to the open hearth room, kitchen and dining area. The kitchen features a center island & peninsula, pantry, stainless steel appliances, separate beverage refrigerator & additional prep sink. Once dinner is served you can enjoy coffee with your guests in the living room as the kids keep themselves busy in the cozy enclosed front porch. After your guests depart you'll find some peace and quiet in the den prior to retiring to the master suite. Upstairs, the spacious master suite offers an abundance of room to comfortably accommodate a king size bed, you'll find a walk in closet and a updated private master bath. After your guests depart you'll find some peace and quiet in the den prior to retiring to the master suite. Upstairs, the spacious master suite offers an abundance of room to comfortably accommodate a king size bed, you'll find a walk in closet and a updated private master bath complete with two sinks, new flooring and a walk in shower. The upper level also offers two additional bedrooms and a full bath. The addition of a large two stall attached garage complete with heated/cooled unfinished bonus room above makes this farm house easy and enjoyable to come home to. However, if that isn't enough space to keep your tools and toys then perhaps you could utilize the 3,200 square foot barn. Formally a potato barn, this structure has been home to countless tasteful large gatherings for family birthdays, anniversaries, weddings, MSU/U of M games, baby showers and wedding showers. The barn offers limitless opportunities for fun and games or to keep anything your heart desires. Complete with a full basement and loading dock the possibilities are endless. The meticulously maintained grounds and grape arbor make this land unique and special. The grape arbor is an amazing sanctuary for family and friends to enjoy memories of lingering meals shared together. As if that is not enough you'll be surprised to find the clean, dry and fresh smelling Michigan basement, complete with laundry, mechanical and yes, more storage. Could it really be true? A 1900's farm house with an updated kitchen complete with a pantry, walk in closet in the master, private master bath, dry clean basement and so much more??? Come see for yourself.